Every IB CAS student at BIS is given an opportunity to establish solidarity with the marginalised and excluded in the local community; to contest social inequality and to assert a common humanity (SERVICE). Students also act creatively in order to discover the extent to which they can reimagine and reshape the world and in so doing take a stand against the forces of conformity and dependency (CREATIVITY). Students also engage in ACTION so as to invigorate a productive and purposeful body-mind synergy. CAS is not for the fainthearted: it works, if the student does. 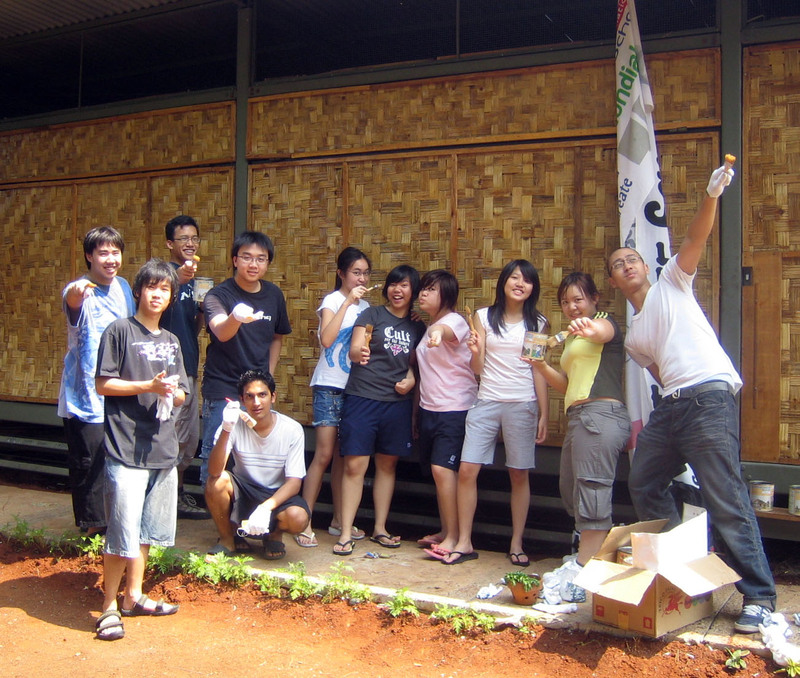 CAS students bequeath a bamboo school - now recognised by the Ministry of Education and in its fourth full year of providing an education for young Indonesians previously excluded from school, due to poverty. 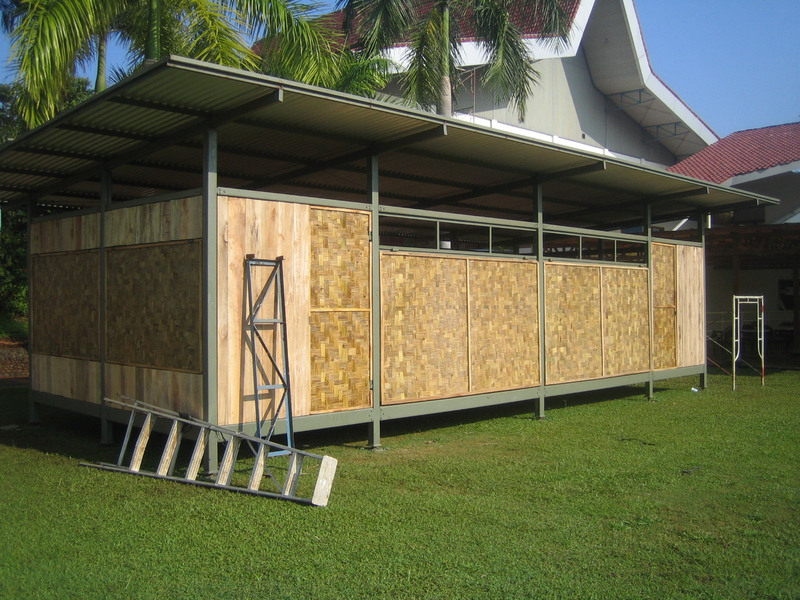 Fundraising is now underway for the exciting, phase two development of the bamboo school: a two-storey permanent structure built to eco-friendly standards and targeted to open June 2010. Our thanks to parent Maria Phang who generously donated 20,000,000 of the target 100,000,000 needed for the ne school. If you would like to be a part of the bamboo school students' future, and donate, contact dorian_brown@bsj.sch.id - and align your life with another. All CAS activities reinforce the idea that to live, is to become: and 'becoming' requires a hands-on engagement with activities that explore the degree to which a student can create (for example nutritious meals for children whose diet is impoverished); can serve (for example, entering a team of scavenging children in the annual inter-school Coca Cola soccer League) and move (that is, engage in all kinds of physical activity). WHY WE DO WHAT WE DO: and why we can't NOT do it. Articles 7 & 8: “The child shall be registered immediately after birth and … have the right … to a name … a nationality … and to preserve his or her identity ….” We are advocates of this article because students discover amongst marginalised communities in Jakarta that many children are not registered as citizens of their own country., with negative consequences for access to health, education and mobility. Article 23 recognizes “… the right of the disabled child to special care” and the right to “… enjoy a full and decent life in conditions which ensure dignity ….” We advocate these articles in particular through a long association with Syap Ibu, a home for handicapped children, and through supporting access to a doctor for a ten year old, near-blind boy, named Ila. Article 24 recognises all children have the right to “the highest attainable standard of health, including access to primary health care, nutritious foods and clean drinking-water.” We are advocates of this article through the provision of fruit to scavenging communities; through our Clinic Kecil health program and through monitoring the health of all the children we support in every one of our programs. Article 31 recognizes “… the right of the child to rest and leisure, to engage in play and recreational activities appropriate to the age of the child.” We are advocates of this article by ensuring that children from a shanty near our school enter the Jakarta schools' JFSA Coca Cola League. Articles 32 & 36 recognise that children must be “protected from economic exploitation ... from [hazardous] work [and] all other forms of exploitation.” We are advocates of these articles through our sponsoring of schooling for 11 young scavenging children and by employing two boys at BIS who were formerly scavenging, shoeless, on the streets of our community. Through direct action, staff pay the boys' stipends from their own pockets. Article 27 recognises that every child has “the right to a standard of living adequate for [her/his] physical, mental, spiritual, moral and social development.” We advocate this article through many CAS activities, including those that provide respite for children from degraded circumstances, but most importantly through educational programs for children excluded from school. Articles 28 & 29 “recognize the right of the child to education … [that develops] the child’s personality, talents and mental and physical abilities.” We are advocates of this article many,many times over in the children we send to school. If you'd like to sponsor a child, just email. So far we have extensive sponsorship from the American Women's Association in Jakarta; through private bequests and through ad-hoc fundraising. It costs US$100 to keep a child in school for a year: not much to change a life. The Convention on the Rights of the Child is a living document because at BIS students make it so. But a child's right is only affirmed through action. Our actions are only good when a child benefits. 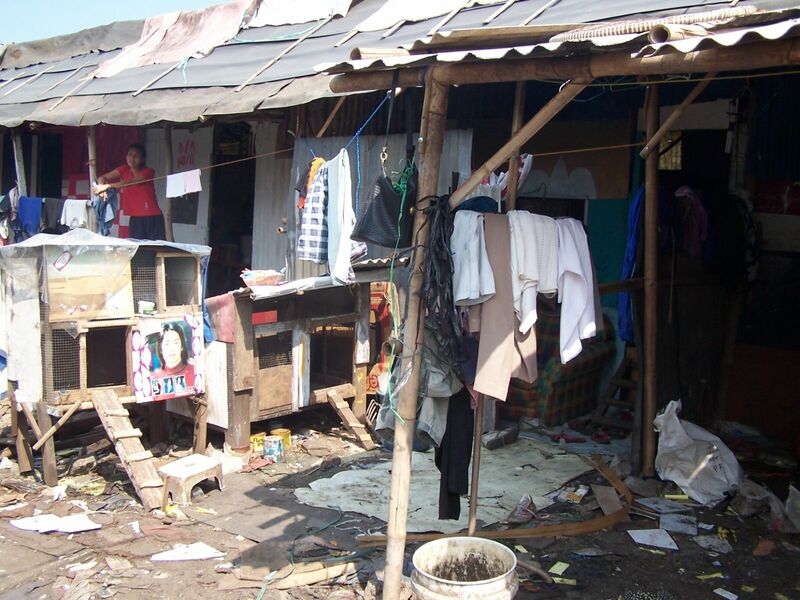 CAS contests why children in Indonesia are obliged to grow up in shanty communities, like the one above. Sometimes we have to contest the parents' choices, who choose to leave the family home in the kampong; who choose subsequently that their children are not registered at birth, are not innoculated and do not attend school. That in itself is quite a contest! But we also contest the blindness in society, which causes us to look, but not to see. Or, worse, causes us to see, but not to feel. Restoring our capacity to feel - a neurologial and moral function - is vital to the CAS students' experience and an essential part of a students' growth.